One thing that I took away from BarCamp DC was that there is a really awesome tech community in the Washington DC area. It may be spread across a number of groups. It may be in multiple states. Regardless, there is an awesome technology community that exists. The question I and a number of others had was how can we bring this community together. We need one place online where the community can go to chat with one another and keep up with what’s going on. It’d aggregate a lot of information from other sites. My esteemed DC colleagues agreed. 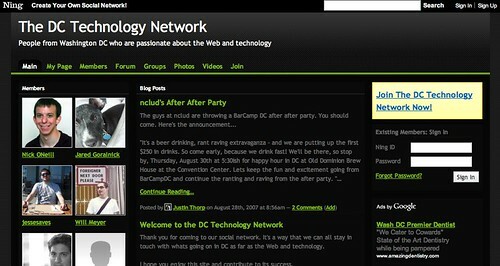 I’m very happy to announce the launch of the DC Technology Network. It is a social networking site powered by Ning. While the site is very primitive (or beta) and still evolving, I think it’s a fun and interesting way for us to all stay in touch and maintain that awesome feeling that existed at BarCamp DC. So… if you live in the Washington DC metro area (or formerly lived in the area) and want to stay in touch with your fellow local geeks, PLEASE SIGN UP for the DC Technology Network. Have you signed up? What do you think? How can we make this more useful? I’ve signed-up and wanted to thank you for putting this together. I always hoped the refresh-dc forums would pick-up more traction, but this will hopefully fill that void for me. I think leveraging some of the functionality ning offers might help better facilitate this online community’ness. Justin great idea! I’m curious if there is anyway to integrate this with Facebook, as it seems that its the jumping off point for so much web activity these days. I wish Southwest Florida had a big web development/standards group. 😦 I think I need to move!